“Elegant” and “funky” aren’t words you’d expect to find in the same sentence, let alone used to describe the same album. 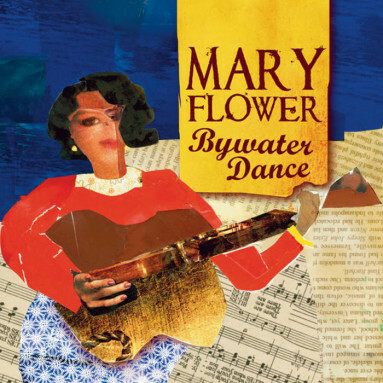 But Mary Flower, one of America’s finest blues and roots performers, pulls off that feat with Bywater Dance. A singer with a springwater-clear voice and an accomplished fingerstyle guitarist who also plays flawless lap slide, she reaches to the deepest roots of American roots music for her Yellow Dog Records debut. Bywater Dance brought Mary to a steamy district just downriver from the French Quarter, where her masterful guitar was joined by some of the Big Easy’s finest – Henry Butler, Jon Cleary and Dr. Michael White, among others. You’ll hear rolling rhum-boogie piano, moaning Creole clarinet, ragtime washboard and primally funky sousaphone, as Mary is joined by each partner in turn for a marvelous musical dance. The result sometimes sounds like Memphis Minnie fronting the Hot Five – neither strictly traditional acoustic blues nor straight New Orleans jazz, but a bewitching blend of both that is something new and different. Funky and folky, bluesy and beautiful, Bywater Dance is one irresistible musical journey.